SuStaDrol is a pro-hormone product that promises to increase your muscle mass and to help you get the maximum value out of all of your workouts. SuStaDrol also contains liver protectors to help remove impurities. SuStaDrol is a pro-hormone product that promises to increase your muscle mass and to help you get the maximum value out of all of your workouts. If you are tired of working out with minimal results, the makers of SuStaDrol believe that their product could be the solution to all of these problems. SuStaDrol stimulates the release of testosterone in your body which promotes quick lean muscle gain with huge strength gains. 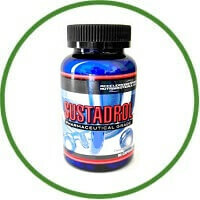 SuStaDrol also helps reduce body fat, enhances libido and vigour, and promotes higher skin vascularity. SuStaDrol also contains liver protectors to help remove impurities. SuStaDrol claims to combine 3 pro-hormone ingredients into one. The three ingredients are S-Drol, H-Drol, and D-Stianozol. S-Drol: SuStaDrol claims that this ingredient targets your body’s hormonal levels and promotes the release of more testosterone. With more testosterone, you will have a higher endurance and more energy. This will allow you to work out harder and achiever greater results. H-Drol: SuStaDrol claims that this ingredient will reduce the amount of fat located around your muscles. With this fat gone, your muscles will be more prominent. It also claims to increase hormone levels in your body which give you more energy which allows you to work out harder. D-Stianozoz: SuStaDrol claims that this ingredient is responsible mainly for the “insane” muscle gains you will experience while taking this supplement. SuStaDrol may help give you bigger muscles; that much is true. The only problem with the claims of this product is that it will not actually increase your muscle mass by increasing your hormone levels. None of these ingredients have been proven effective in hormone or testosterone production. One redeeming factor of SuStaDrol’s formula is the fact that it includes milk thistle. Milk thistle is an ingredient that should help protect your liver, which is necessary because some of the other ingredients in this product are harmful to your liver. Although no side effects were listed, some side effects are possible. The ingredients in SuStaDrol are included in very high doses. This may have adverse side effects. If you do experience any side effects, we recommend discontinuing use of this supplement and talking to your doctor. We do not recommend this product at this time. Even though you may take this supplement and achieve results. However, the product’s credibility is lessened because of the incorrect claims that in makes. This product will not increase any of your hormone levels.